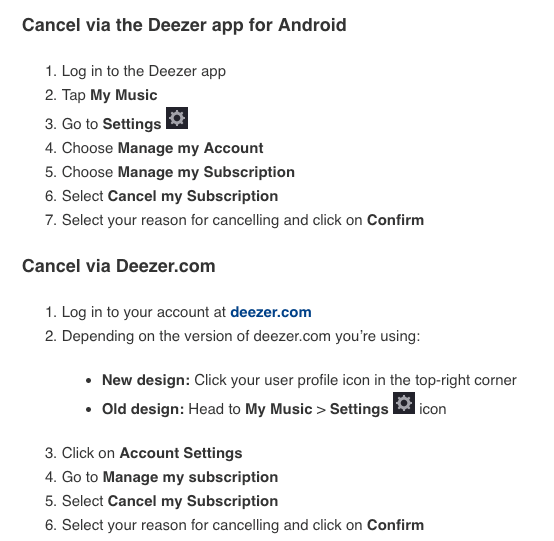 You can cancel your Deezer subscription anytime, no commitments. Below are the steps to cancelling, per subscription type. As Apple handle all your payments, you will need to cancel your Deezer subscription through them. This is because Deezer cannot access their system, and therefore cannot access the account you pay with. Find out how to Update and cancel your subscription with iTunes. As your mobile phone provider handle your payments, you will need to contact them in order to cancel your subscription. As we do not take money directly from your account, we have no access to it. If you’ve forgotten your password and can’t log in, request a new one with our handy tool if you’re using the website, or just click on Forgotten your Password? if you’re using the app. Very occasionally, a bug might come up. Otherwise, contact our Support Team. I am trying to cancel my account but the option does not show up. The page isn't loading or there is a bug. I need to cancel my account. It's a premium subscription directly from Deezer. We noticed today that some users are not able to cancel their account. In this case, please get in touch with our support team Hi there, if you are not able to cancel your account. please get in touch with our support team here or send me a private message here! Our developers are investigating this issue! same thing happened with cricket users. there was no cancel button to migrate over. Hi @amoraluv Cricket never have this button in general, because the subscription goes through Cricket and not directly through us. This doe snot concern Cricket subscribers. i cancelled 3 months ago and is still being charged!!! I am pissed !!!! please get a freaking contact us link!!!! WTF !!!!! please stop chaging me and refund 3 months!!!!!!!!!!!!!!!!!!! customers (some) want a freaking contact us link!!!!! not pushed to a forum! i recently create an account with the email deleted to protect personal details but i can not retrieve my gmail account. could you please cancel the free trial (its finished this month) from this account?